Walton High School Cinder Club - What is Cross Country? Cross country is a team sport of long distance running. Practices and races are usually held on an open terrain consisting of woods, fields, and hills. Terrains differ for each race. What distances are normally run? Most of our races will be 5Ks. The National Federation of High School Associations has set a minimum of distance of 2.5 kilometers ( a little less than 1.5 miles) and a maximum of 5K (3.1 miles). Cross country is different from most sports because the lowest score wins. The boys race is separate from the girl’s race. Varsity races are separate from JV races. Varsity events are run with a maximum of seven athletes per team. Some JV events are open and allow more runners. The places of the first five athletes on each team are added together to determine the team score. The sixth and seventh runners contribute by finishing ahead of other teams’ top five runners and increasing their scores. It is important for the team to finish as close together as possible. For example, a finish of 1,3,4,6 and 83, (a score of 97) will lose to a team finishing 16, 17, 19, 21, and 23 (with a score of 96). Meets are normally scheduled on Saturday mornings. Meets may last a few hours or all day, depending on the organization and number of entries. All athletes are encouraged to watch and cheer on their teammates in other races before or after their own race. Athletes are typically requested by the head coach to arrive at meets at least one hour prior to their race so they have time to warm up. See the meet schedule each week for specific information. Most meets will have four races, usually 30 minutes apart. The four races are varsity boys and girls and JV boys and girls. 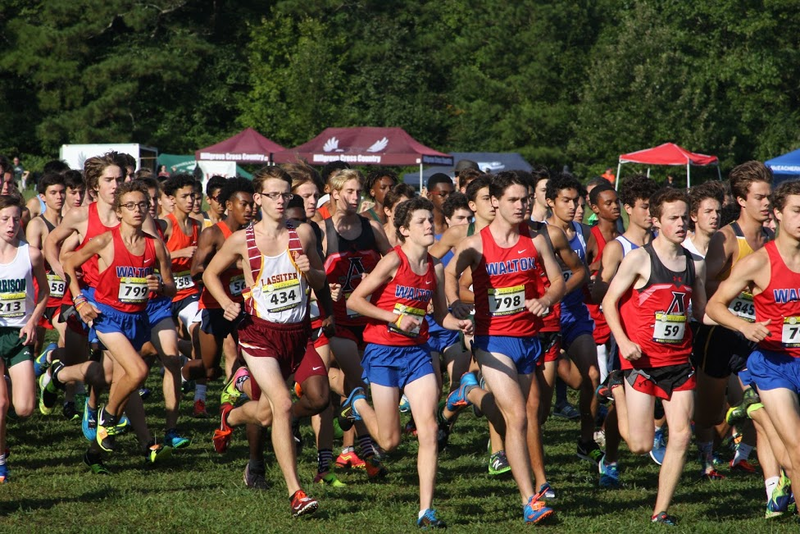 According to the Georgia High School Athletic Association, varsity athletes may only compete in 10 races during the season and junior varsity athletes may compete in seven races. The head coach will select which athletes will run each week in which races mostly based on their performance from the last race(s). Athletes selected to run in the varsity races at the region and state meets are those athletes who have typically shown the most consistency throughout the season. Pack your bag the night before a meet! Wear your Walton singlet and shorts under your sweat pants and sweat shirt. Be sure to pack your running shoes, racing spikes, an extra pair of shoes for after the race, extra socks, watch, dry clothes, a drink, etc. Transportation for athletes to/from meets is typically provided by the school. There might be random meets that the athletes will be asked to provide their own transportation. If an athlete needs a ride to a race, parents may contact a Cinder Club member who is assisting in coordinating rides to that particular race. He/she will strive to place your athlete with a parent who has room in his/her vehicle for extra riders. Runners will stretch and do a “cool down” run with their teammates shortly after finishing the race. They can change into dry clothes at this time if necessary. Runners are encouraged to stay for the awards session upon the conclusion of the race, too. It’s fun for our team to be rewarded after training well! Cross country is not the typical spectator sport because spectators cannot see the entire race from one location. Spectators may want to pick their spot(s) prior to the race start for best viewing of the race. Spectators are encouraged to help cheer on all Walton athletes. Come dressed in Walton apparel to identify yourself as a WHS supporter and show your school spirit! Parents may want to bring a comfortable chair to sit in while waiting for the races to begin. Look for the WHS team tent or flag to identify the team’s staging area. Bring your camera. Photos of all athletes are compiled in a slide show for the banquet, and volunteer photographers are always needed to assist. Abide by parent code of conduct.